Trying to get kids to chip in more around the house? 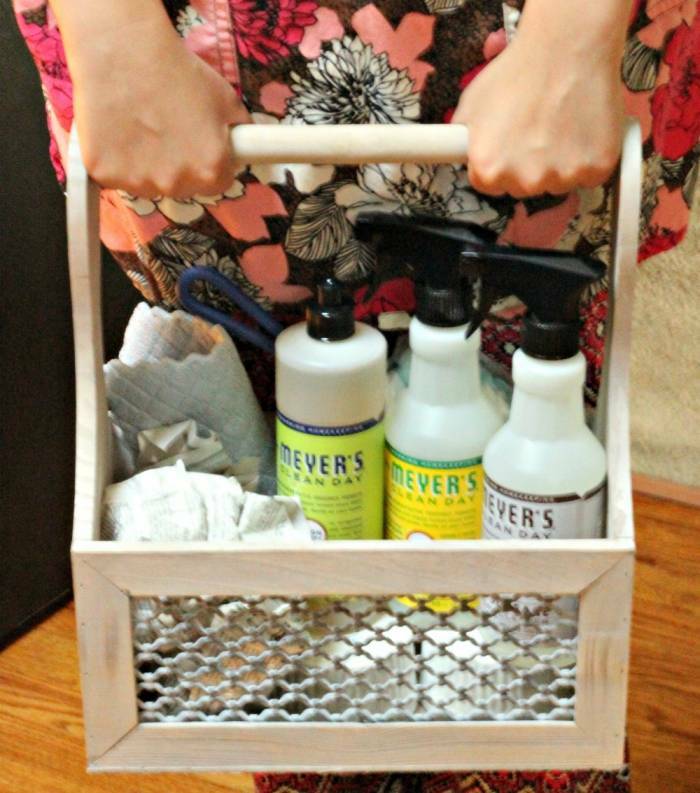 This DIY Kid-friendly Cleaning Caddy will motivate them to help out! Every summer, we have an odd sort of tradition in our family – our kids learn a new skill with regards to home keeping and it's been a tradition in our house for over 15 years. In addition to swimming, traveling and having lots of other fun, we also think it’s very important to teach our kids life skills and summer is the perfect time for this to happen. And I've learned that one thing that goes a long way to making it easy for kids to help around the house with adult supervision is for them to have their own cleaning caddy and weekly jobs that they can learn to master. Teaching kids to master a new skill can take a little time - it's not just a one session, quick lesson if you want them to take pride in their work. Our schedules during the school year are fairly hectic so when life is a little slower over the summer, it gives my husband & I time to really show our kids the in's and out's of their new household jobs and it also gives our kids some time to master their new skill before school begins. So when we all head back to school, everyone has a new set of ways they contribute to the house & family organization. When I taught my son how to clean windows, he watched very carefully and did exactly what I did. That's why adult supervision is so important. Each child will learn at a different pace and that's totally fine! A 5-year-old learning to make their bed is NOT going to get it perfect like you may. So give them responsibilities around the home where you won't feel the need to 'fix their work'! This is a biggie! If they see you following up behind them to correct what they do, that will defeat the purpose of it being their responsibility. And second, you SHOULD expect them to improve over time. Giving a child positive feedback on how to be more detailed at their task and then praising them when the job is done well goes a long way to helping them learn the skills. Creating a cleaning caddy for your child allows them to feel ownership over their work tools and their jobs. My advice: Keep it simple! Include a few all-purpose cleaners so that they aren't confused over which cleaner to use for each job. I also allow our kids to choose what they want to clean with -- the types of cloths or rags, whether they want to use gloves (this was a big thing when they were little), etc. And have an apron or oversized shirt in the caddy also -- this will help to keep their clothes clean while they clean especially when they are learning. Add in any other items you might use when YOU clean too -- kids are big on modeling what adults do. 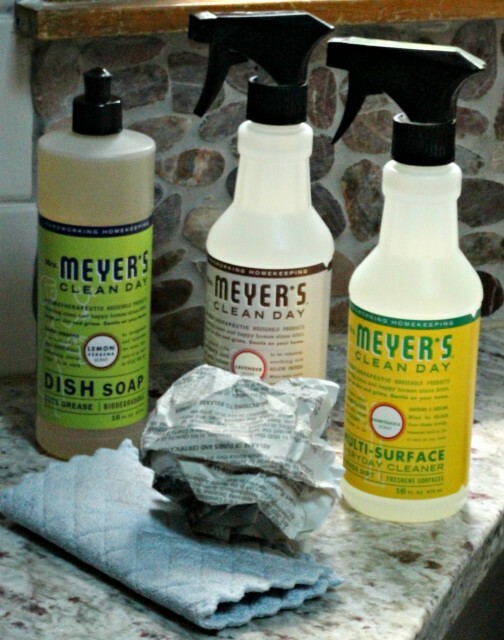 We use Mrs. Meyer's Clean Day® products as everyone in our house has some form of eczema -- these household cleaners are free of artificial colors, ammonia, phthalates, chlorine bleach, parabens, and phosphates. They are also biodegradable which we appreciate because we try to be a 'green' family whenever possible. 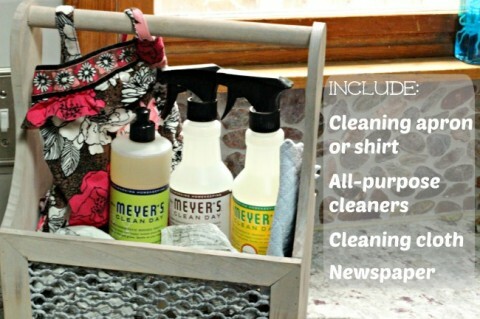 I also include the Mrs. Meyer's Clean Day® Dish Soap in Lemon Verbena in the cleaning caddy as it's a great soap to mix with water and use for dishes, cleaning the outdoor table or toys, rubbing down bathroom doors and other cleaning where you'd rather use a soapy cloth than a spray. One of the big reasons that we introduce a new cleaning activity each summer is because one day our kids will grow up and leave home and they darn well better know how to clean (and cook and all those other things that make the world go round)! In fact, our oldest left for college last year and one of the first things he noticed about his new friends is that the definition of ‘clean’ varies by person. Starting a household cleaning routine at home goes a long way to helping your child become a self-sufficient adult -- and starting them young is a great way to help them appreciate all that goes into maintaining a home. There are a few responsibilities that are done during the week -- setting/cleaning the table each night for dinner, running/unloading the dishwasher, organizing the front hallway so the shoes don't take over the house :) but the majority of our home-keeping is done on Saturdays. I grew up with "Saturday morning chores" -- once breakfast was over, the whole family go to work to get the house ship-shape! And once it was done, we had the whole weekend to enjoy an organized home and then things didn't get so out-of-hand during the busy weekdays either. So I guess this family tradition just stuck because that's how we do it too. I know some familes who do one room each day of the week and others who like to do cleaning on Sunday afternoons so the house looks great on Monday. Choose a schedule that works best for your family -- the most important thing is to get the kids involved! Here are a few ideas for age-appropriate jobs that your kids can help with -- this is by no means a complete list and should be adjusted based on your family's needs. Since we really only add new jobs each summer, I try to space them out across various rooms of the home. This shop was originally compensated by Collective Bias, Inc. and its advertiser. All opinions are mine alone. I love these products! It's really cool how you broke down tasks by ages! That's really helpful! I haven't used this for my daughter yet but I'd like to see what it offers.